Would you spend hundreds of dollars to make sure your documents won't end up in the wrong hands? You may not need to—there are much better options available. 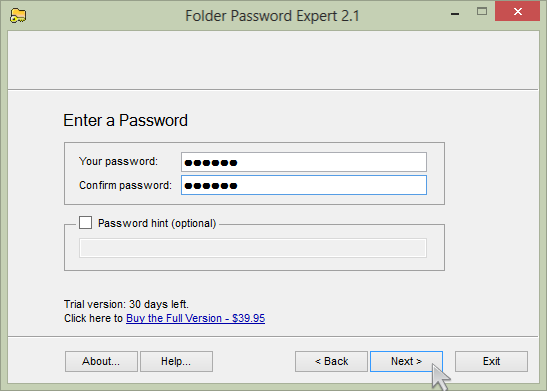 Folder Password Expert is a security software program that allows you to protect folders against unwanted access, and it sells for only $39.95. The program can lock folders on an internal hard drive, flash drive, external USB drive, thumb drive, memory card, pen drive, and network drive. Lock an unlimited number of folders in the full version of the program. The password is always required to open locked folders, even if your drive is plugged in another PC. 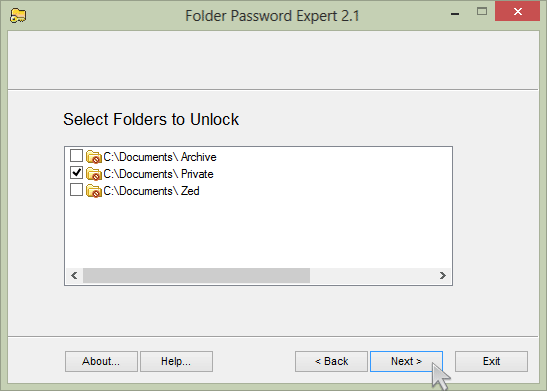 Set a password for folders of your choice without moving the folders to any special folder locker. Use different passwords for folders or groups of folders. The program stores not passwords but their check sums so hackers cannot get your passwords by any means. Protect folders on your USB drive, internal hard drive, memory card, flash drive, pen drive, or network drive. Right-click the folder in the right pane of Windows Explorer and select "Lock folder" from the pop-up menu. To complete the process, enter your chosen password. Unlocking the folder is also easy: double-click it in the right pane of Windows Explorer and enter the password. 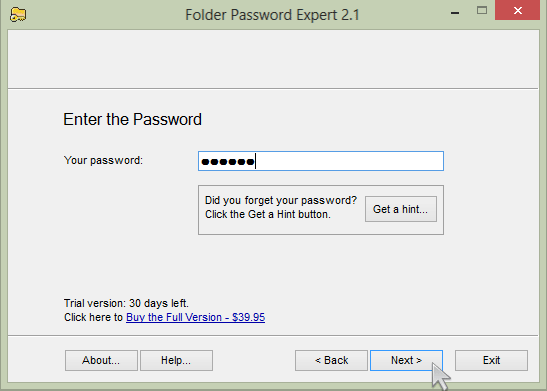 Will Folder Password Expert work on my computer? 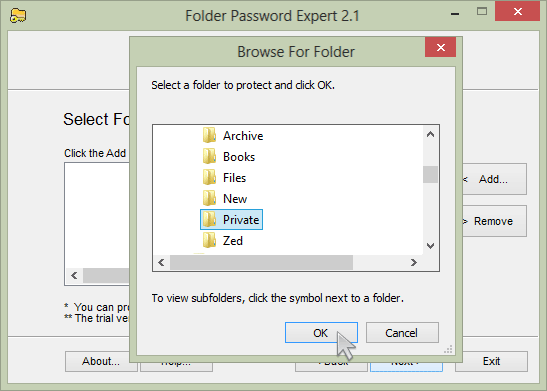 If you use Windows, Folder Password Expert was designed for you. The program was successfully tested on Windows 10, 8, 7, Vista, XP, 98, NT, and ME and is completely compatible with both 32-bit and 64-bit Windows. Use the $39.95 program for the whole month at no cost to you. Download software, and it is yours. Feel how easy it is to put a password on the folders you wanted to protect. It is absolutely safe to try the program to make sure it suits your needs. You will always be able to enter your password and unprotect folders even if your trial period expired long ago. We are against the common but unfair practice when software companies insist that you buy their product to be able to access your own data. It cannot password protect more than 3 folders. It cannot password protect folders larger than 50 MB. The program has a wizard-style interface allowing you to select and protect or unprotect multiple folders at once. 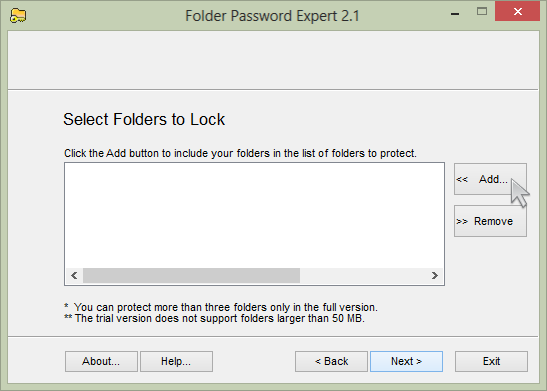 It makes the program so easy to use that even a beginner can set a password on a folder without any prior training. A license is moderately priced at $39.95. This is a one time only fee. You can use the program as long as you want to as the license never expires. The license comes with upgrades to all future versions of the programs. You can always download the latest version from this site without having to pay for it. This is a limited opportunity; upgrades cannot always be free. Don't miss out on this chance to order the program with all upgrades for just $39.95 now. Our money-back guarantee is the longest in the industry. If you are not happy with the program, you get a courteous refund of the full purchase price minus handling within 90 days of the purchase date. When you fill out the secure online order form and buy the full version of the program, the serial key is generated automatically and displayed on your screen. It is also sent to your e-mail address so that you have a copy of it for future reference (in case you want to transfer the license to your new PC or reinstall the program after a Windows upgrade). by David, Golden Reflections, "Computer Tips"